Warming Up – Part 1, At the Walk. Warming Up – Part 2, at the Trot. Warming Up – Part 3, at the Trot. Counter pattern, change of rein into the corner. 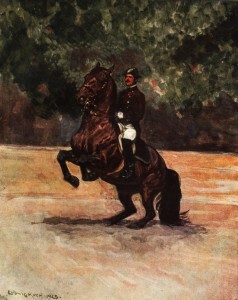 Developing the Canter through Counter Canter. Conveniently located just south of Atlanta Georgia within a half hour drive to Atlanta’s Hartsfield International Airport, Krowchuk Dressage specializes in Classical Dressage Training and Instruction. On-Site Dressage Lessons can be provided on our qualified school horses, students may haul their own horses in, as well, Head Instructor Chris Krowchuk is available to travel Off-Site to your facility to teach or train the classical system of Dressage. Off-Site lessons are a popular method of receiving Classical Dressage Lessons on your horse without the need to trailer your horse. Chris Krowchuk is also available for 2 or 3 day clinics anywhere in the USA. Past clinics have included Alabama, California, Hawai’i, North Carolina, Texas, and Minnesota as well as internationally in Canada, England, and France. A series of training articles authored by Chris Krowchuk are available here. Full Board is available for horses in training. (c) 2005 - 2017 Krowchuk Dressage and Chris Krowchuk - All rights reserved.